Every little girl deserves to feel like a princess and believe it or not that’s easy to do with the right kid’s size furniture. Give that special girl in your life furniture that’s just her size, so she can spend every day feeling like Cinderella in those perfect fitting glass slippers. First, start by getting a beautiful vanity where your little princess can primp and admire her beauty each day. 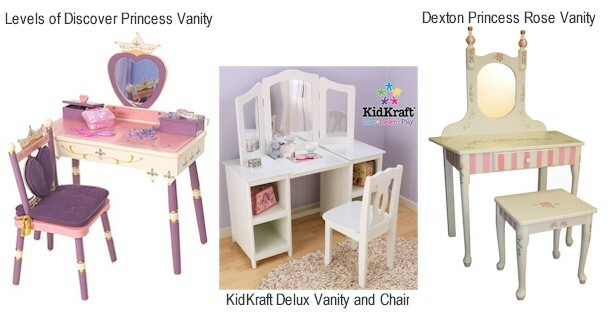 If your adorable empress loves to play dress-up with make-up and accessories then consider getting a totally decked out vanity with lots of storage space like the KidKraft Delux Vanity Chair in White. If she loves glitz and glamour and wants a dressing station that’s designed for royalty then get the Levels of Discovery Princess Vanity Table and Chair Set. If your little lady of the court prefers furniture with a more subdued and elegantly feminine style then go with the Dexton Princess Rose Vanity Set. Either way, adding a vanity to your daughter’s bedroom or playroom will remind her of how beautiful she is and make her feel special all throughout the day. Next, give your little Snow White a place where she can snack on apples or have tea parties with friends by getting a kid size table and chair set. If your darling countess likes to have more than one friend for tea or has siblings who wish to join her royal highness at the table, then consider getting the KidKraft Nantucket Table with Bench and Two chairs because it has plenty of space and seating for up to 4 children. If your precious heiress wants to dine or play at a table that creates a fairy tale vibe then get the Levels of Discovery Value Lines – Fairy Wishes Table and 2 Chair Set. If her majesty wishes to be seated in a space that is quite sophisticated looking then consider getting the Dexton Princess Rose Table and Chair Set. The last item on the must-have list for any royal bedroom is a beautiful and comfortable throne…otherwise known as a kid size rocking chair. If your child wants to be joined by other members of the royal court then consider getting the Kid’s Korner 2 Seat Puzzle Rocker that can fit 2 children comfortably. If her majesty wishes to be the center of attention in her own special seat then get the Levels of Discovery Rock a Buddies Jr. Princess Rocker that is not only made for a princes, but comes with a built-in photo frame where your child can put her favorite picture to claim her special chair as her own. For the duchess who requires extra pampering and comfort, choose the Kid Kraft Upholstered Rocker with Ottoman in Pink Chenille. With these three kid size furnishings in your daughter’s bedroom including: vanity, table and chair set and rocking chair, your little princess will feel like the head of the castle for sure!